Recently I’ve picked up a few bits, some are repurchases and some are new. I didn’t need a huge amount of stuff and was pretty tame with my purchasing as I’m trying to do a low-buy this year and be more selective with what I purchase. I purchased five items by Catrice. I repurchased their Liquid Camouflage concealer in the shade ‘007 Natural Rose’. This is one of the very best affordable/drugstore concealers there is. It’s creamy, high-coverage, blends easy and lasts really well. A tiny bit is all you need because of coverage it gives. Less is more with this concealer. I accidentally picked up the wrong shade.  007 is a little too light for me, but I can mix it with some of my others and hopefully make it work. I have used this in the past, but found I needed to mix two shades together to get a good colour match for me. It’s only €3.95 too so it’s a bargain. 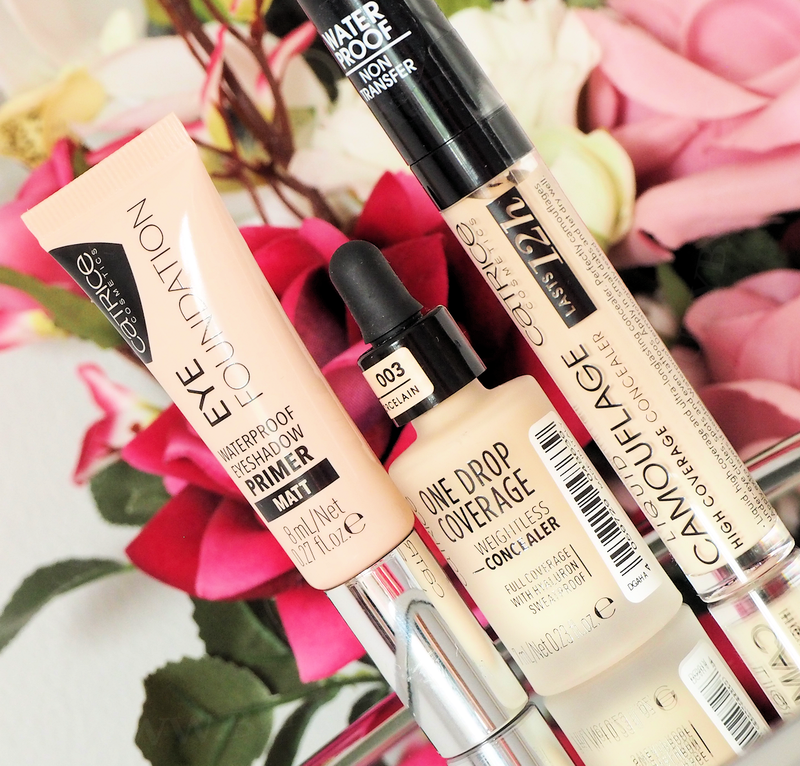 Well worth checking out if you’re in the market for a new concealer. I recently did a post on their new Spring/Summer collection from (here) and included in that collection is their ‘One Drop Coverage Concealer’. I have the shade ‘010 Light Beige’ which is the same as my own skin so not great for brightening, so, I purchased the shade ‘003 Porcelain’, which is a better colour for brightening my under-eye, but without being stark or too light. I also picked up two Lip Foundation Pencils in ‘020 Caramel Blonde To Go’ and ‘030 Addicted To Café Au Lait’, both of which are nudes (surprise surprise ). I really, really like these. They are very pigmented, creamy, long wearing, they apply nicely and evenly and don’t drag on the lip. I love them on their own with a little dab of balm or gloss over them or under a lipstick too. They were €2.80, which is a steal given how good they are. I’ll definitely be picking up some other shades. My final Catrice purchase was their Eye Foundation Waterproof Eyeshadow Primer in ‘010 As Strong As You Are. I don’t have oily eyelids or os issues with eyeshadows creasing, however I do like to use a primer to help my shadows stick better and be more pigmented. I’m using this currently but I’m not 100% on it. It’s nice and for the price it’s fine, but it’s nothing amazing. I will have a review of this up soon for you. I placed an order on Superdrug as I wanted to get the E.L.F Cosmetics Poreless Putty Primer. I’ve heard so many people comparing this to Tatcha’s Silk Canvas primer, which I’ve never used but have two samples of and I really wanted to compare them and see if they are alike at all. I have pores around my nose which drive me mad, so anything that helps them, I’m all for. I will make sure to let you know how I find them both. You can purchase the E.L.F Primer here. I also purchased their Simply Pure Hydrating Serum Day & Night Serums. I have seen Lauren from The Makeup Maestro using both of these and she highly rates them, so when I saw they were buy one get one half price I decided to pick them up. You can purchase these serums here. Because I love an overnight mask but am running out of my current one I ordered the Calm Skin Overnight Face Mask and Simply Pure Leave on Water Mask. I’m all about the hydration and anything that promises hydration I’m drawn too. I adore the Lancôme Hydra Intense Gel Mask, however that is €39 so I figured they were worth a shot especailly as they were also on the buy one get one half price offer. You can purchase the Simply Pure Leave on Water Mask here and the Calm Skin Overnight Face Mask here. Have you done any shopping lately? What did you buy? Follow me on Bloglovin’, Facebook, Instagram, Pinterest and Twitter.